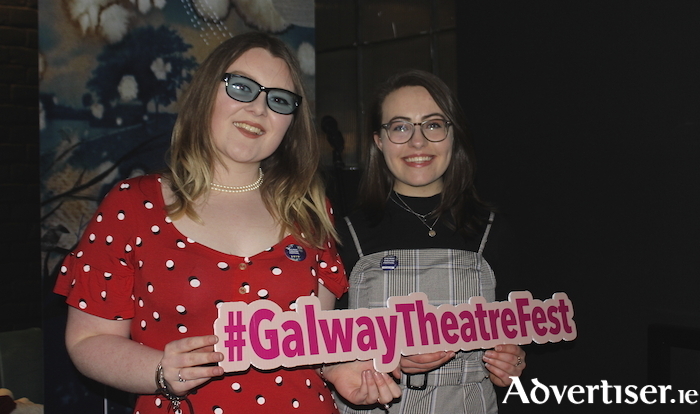 Alice Keane and Emily Jane Jackson at the launch of the Galway Theatre Festival. Pictured below are Sinn Féin councillors Mairead Farrell and Mark Lohan, who also attended the launch. The Theatre Festival brochure spoke of “magic to be found in the most unlikely and ordinary of places”, a theme echoed by festival director, Sorcha Keane, who encouraged those attending to, "take a moment to slow down, look around with open eyes, and see beneath the surface". The main speaker at the launch was Jane Daly, from the Irish Theatre Institute, who noted that “living and working in the west of Ireland is a challenge” for theatre makers. She also called for “more funding, more incentives, more infrastructural and long term supports, to be offered as part of a broader ambitious cultural strategy for the west”. Early Bird tickets of €8 will be on sale until April 19 via www.galwaytheatrefestival.com and the Town Hall Theatre (091 - 569777, www.tht.ie ).